A waterfall can be defined as the place where water flows over a vertical drop in the course of a stream or river. It can be also a place where meltwater drops from a tabular iceberg or ice shelf. Waterfall can also be said as the natural wonders on Earth. It is always amazing to see the billions of gallons of water drops from the vertical limit. The voice of the dropping water is enough to produce amazing sensations in your body. So, here we are listing the 10 of the World’s most beautiful and amazing waterfalls. Victoria Falls are one of the largest waterfalls in the world. The waterfall is located at the Zimbabwe and Zambia border. The fall has a height of 354 ft (108 m) and wide (5,604 ft/1,708 m) making it the biggest waterfall in the world. Devil’s Pool in Victoria falls is one of the most famous natural swimming pools among tourist. The waterfall has been discovered by a man named David Livingston in 1855. He named the waterfall after Queen Victoria. We have also listed spectacular waterfalls in India. From Zimbabwe: This is the quickest and the most popular way to reach Victoria falls. You need to take a flight from Johannesburg, South Africa (JNB), to Victoria Falls, Zimbabwe (VFA). Duration would be 22 hours. From Zambia: The main entry point to the falls in Zambia is Livingstone Town. You need to take a flight from Zambia’s capital, Lusaka, or Johannesburg to Livingstone Airport. From, Livingstone it’s just 6 miles away. The fall is located on the border of Brazil and Argentina. The waterfall is a combination of 275 separate waterfalls spread along the width of 2 miles. There is a tip for the visitor that if you are going to visit this waterfall does check the Devil’s Throat. The spray is very much intense here. The fall has a height of (285 ft/87 m) and width 8858ft (2700 m). How to reach: You need to take a public bus from Puerto Iguazu to the town of Foz do Iguazu and then jump on bus 120 from the bus terminal to get to the Brazilian side. The duration would be 1.5 hours. The fall is one of the biggest things in the world as it is the world’s most beautiful and amazing waterfalls among the tourists. The fall is located near Newyork on the border of the United States and Canada. One of the most amazing destinations in Eastern Canada is also the most amazing falls found in North America. 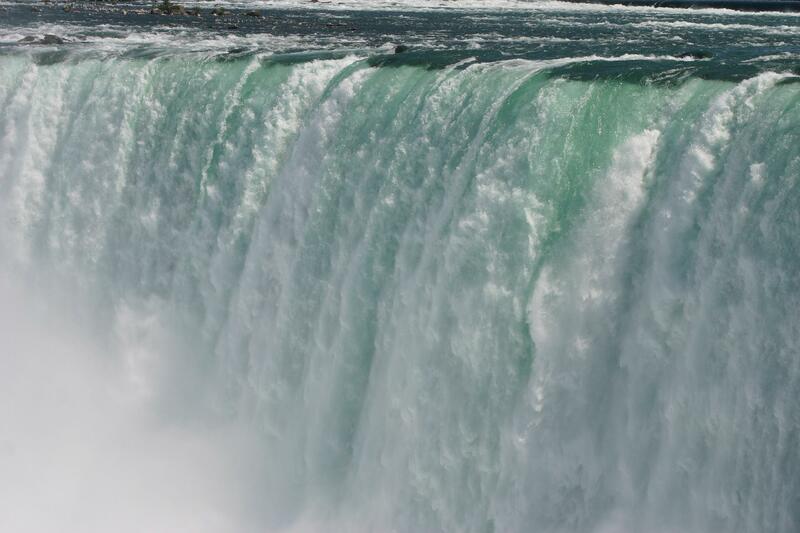 The waterfall has a height of 173 ft (53 m) and width about 70–100 ft (21–30 m). You will also like reading about largest islands of the world. How to reach: There are numerous ways to reach Niagara falls in the United States and Canada, however, the best would be from Buffalo, New York. It will be around 20 miles. The total distance between New York City to Niagara i around 656 kilometres. The fall is located in the Venezuelan jungle in Canaima National Park. The park is protected by UNESCO. The fall has a height of 3,212 ft (979 m). The waterfall is named after the Jimmie Angel who discovered it. The fall is so high that water evaporated before it hits the ground. You should also know about beautiful lakes around the world. Kaieteur Falls is located in Guyana. The Waterfall has a height of 741 ft (226 m). There are also several cascades in between the elevation. The fall is named after the Patamona Indian legend. The chief Kai wanted to save the people by paddling over the falls. This is an act of self-sacrifice and a no doubt a great spirit. It is also called Golden Falls. The waterfall is located in southwest Iceland. It has a height of (36 ft/11 m) and width (68 ft/21 m). The location and the country in which the fall is located are very beautiful. The waterfall is located in located in Fiordland, New Zealand. The fall falls from the height of 1902 ft (580 m) making it one of the tallest waterfall in the world. The waterfall has a unique landscape that makes it even more beautiful. The only disadvantage of the waterfall that it is not accessible to visitors. You need to walk 4 days tramping Milford track or take a scenic flight. Nohkalikai Falls is located near Cherrapunji in India. It has a height of 1100 ft (335 m). The waterfall is the tallest in India. The most amazing feature is that the pool is formed on the land which takes the green colour. How to reach: You need to hire a taxi or board a bus to reach Nohkalikai falls. The journey will start from Guwahati and it will be a 4-hour journey to Shillong, the Capital of Meghalaya. Now, you need to reach Cherrapunji main town and from there its 10 mins away. The fall is located in the Plitvice Lakes National Park, Croatia. The height of the fall is not very tall but the landscape is very beautiful and amazing. It is a combination of hundreds of waterfall. The colour of the water also varies from crystal clear to Azure and to turquoise. One of the most amazing waterfalls in the world. How to reach: You need to take a connecting bus from Zagreb Airport to reach the main bus station in Zagreb. From here, you can then take one of the numerous buses to the Plitvice Lakes. The journey time will be about 2 hours 20 minutes. Book your tickets on the Zagreb Bus Terminal website.